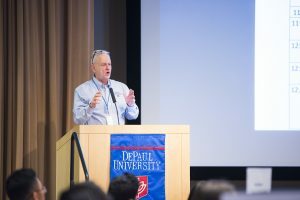 The first High School Actuarial Day was held on April 18 at DePaul University in Chicago, led by the CAS. Our goal was to expose high school students of color to the actuarial profession. 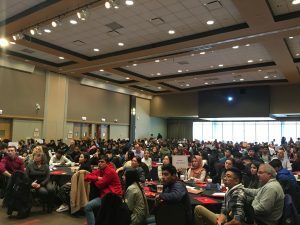 We partnered with DePaul and were joined by the SOA, The Actuarial Foundation, the International Association of Black Actuaries, the Organization of Latino Actuaries, Gamma Iota Sigma, and CNA in supporting the event. We had 300 students and teachers from 14 schools participate. We generally targeted schools with a high percentage of students of color, and within these schools, students in advanced math classes. 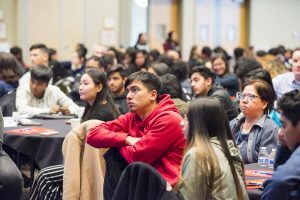 The event was open to all but we believe we met our goal, as there was a significant number of students of color at the event. The program ran from 9:00 a.m. to 1:00 p.m. with 10 general session speakers and 60 volunteers who led discussions at tables of 10 students. Before I provide more details, I need to thank some people, because putting on an event like this requires a lot of work. James King, ACAS is with CNA and is a leader at IABA who is very giving of his time: he visited many high schools to generate interest, was very involved in planning the agenda for the day, and was my trusted advisor. Amanda Parada-Villototro is Director of College Access at DePaul. She coordinated the donation of DePaul’s facilities for the meeting and worked tirelessly to make the event a success. For example, she coordinated our meetings with Chicago Public Schools (CPS), Chicago Catholic Schools, and various other organizations. Briana Botos, FSA at Milliman, visited many local schools to generate interest and was always willing to work hard to recruit more volunteers. I would also like to thanks Chicago Public Schools for their support. Eric Williams, Manager- College and Career Specialist Team and Manuel French, Director of School Counseling were a tremendous help in connecting us with local schools and educating us on high school logistics. I also want to thank the 60 volunteers who led the table discussions and the speakers who presented throughout the day! The goal of the program was to expose high school students to the actuarial profession as a career choice. Recent research on barriers to entry into the profession for under-represented demographic groups has shown that one of the main reasons that students of color do not enter the profession is their lack of knowledge of the profession until late in college. This puts them at an enormous disadvantage as many employers want students who have passed a couple of exams and have completed an internship before offering full time employment. 5.) Some actuarial jobs involve travel, which is exciting. I kicked off the event by providing an overview of the agenda. Next Amanda welcomed the students to DePaul and Tom Edwalds, FSA, ACAS, a professor at DePaul, talked about the DePaul actuarial science program. The next group of speakers were Sharon Robinson, FCAS and Alejandro Ortega, FCAS. Sharon is Chief Pricing Actuary at Zurich where she oversees the work of 50+ people. Sharon shared that she enjoyed math even though it may not have been her best subject and that she liked pursuing the actuarial profession because it was different. Early on she received a brochure with a picture of an African-American actuary and she saw someone that looked like her that was in the career, and this inspired her. It is important to provide role models to the high school students. Alejandro spearheaded the formation of the Organization of Latino Actuaries (OLA). He has extensive experience in Latin America and recently joined Gross Consulting. Alejandro spoke about OLA and the need to increase the number of Hispanic actuaries. Alejandro said that about 15% of the US population is Hispanic and 9% graduate college in STEM fields, but the actuarial profession is only 2% Hispanic. He stressed the support that OLA can provide to Latino members. Next I went through a simple math estimation problem about how many points a professional basketball player would score. I drew on insurance analogies, like when to use a Loss Development Factor method versus a Bornheutter-Ferguson method. We then turned it over to the table leads. We had 40 tables of 10 students and at least one volunteer per table. There were fantastic discussions at the tables and it seemed like the students provided some good ideas. Next I put up a picture of two cars and asked what factors will affect auto premium? The tables then discussed factors such as age of the driver, location, etc. Next we had three speakers talk about different types of jobs that an actuary can have. Chris Reynolds, FCAS is an actuary at SCOR. He explained the basics of reinsurance. He also mentioned that SCOR is based in Paris and educated the students on the potential for travel as an actuary. Dorothy Andrews is an ASA and a predictive analytics expert with Merlinos & Associates. She talked about the growing demand for people with predictive analytics/big data skills. Dorothy shared a great clustering analysis example of how comedians can be segmented by genres and how you can determine which comedian has the most influence in a particular genre. Roosevelt Mosley, FCAS spoke about his job as a consulting actuary and the fact that he gets to travel a lot and work for many different types of companies. We then encouraged table discussions, with the leaders discussing different types of jobs with the students, who were very engaged. The next session discussed the process to becoming an actuary. Rohan Cotah and Michaela Fossberg, two students at DePaul in the actuarial program, spoke about the actuarial program at DePaul. Next Briana Botros, a relatively new FSA at Milliman, spoke about the exam process. We also highlighted that more than 70 companies employ actuaries in Chicago and provided the names of the companies to the students. We then broke into the table discussions where the table leaders elaborated on the process. Next Joe Wurtzburger, FSA and Staff Fellow at the SOA went through a number of logic problems. Joe was a great choice for this section as early in his career he taught high school math. He introduced a number of problems and then asked the table leaders to have the students work on the problems as a group. We wanted to make the point that if the students enjoyed solving problems like these then they likely would enjoy being an actuary. As I walked through the room there was a lot of great thinking and discussion of the problems. We then had a team competition by table to win raffle tickets. We gave each table 20 problems and the more problems they got correct the more raffle tickets they got. The intent was to have the students work as a team. We then drew the two winning tickets and each student at the winning tables got a $10 Amazon gift card. I found out later that one of the winning groups divided the students into 3 groups at his table and had one group do problems 1-7, a second group 8-14, and the third group 15-20. You can always count on actuaries to come up with creative approaches! We ended the event by describing some of the resources available to schools and students. James King spoke about the support provided by the International Association of Black Actuaries. Tamar Gertner, University Engagement Manager at the CAS spoke about Be An Actuary resources, which are jointly provided by the CAS and SOA to educate students about the actuarial profession. Alejandro Ortega spoke about the resources provided by OLA. Jason Leppin, Executive Director of the Actuarial Foundation spoke about the great work that the Foundation does in providing resources to various schools and students . Not only was this event a benefit to the students who attended, but as we promoted the event with high schools visits, we educated a much larger population of students about the actuarial profession. In fact, some of the schools who could not attend have asked us to provide the materials that were presented at the event so they could share them with their students. Several teachers thanked us for putting together the program. They thought it was very valuable for the students. We got especially high marks from Steve Appel at Curie. After being an actuary for 30 years, Steve decided to change careers and teach high school math. He teaches at Currie, which has one of the highest populations of students of color in Chicago. Leaders of Chicago Public Schools also attended and thanked us on the high quality of the event. 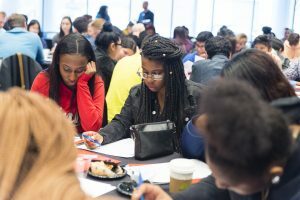 I plan to make this an annual event in Chicago, as we work towards building a diverse pipeline of future actuaries! To view photos from the event, see the album on our facebook page. This is awesome. I would love to see an event similar in the Central Ohio area.